Cointegration theory is based on the simple notion that time series might be highly correlated even though there is no causal relation between them. 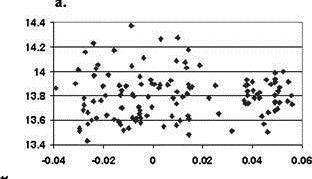 For the relation to be genuine, the residuals from a regression between these time series must be stationary, in which case the time series are “cointegrated”. Since stationary residuals mean-revert to zero, there must be a genuine long-term relationship between the series, which move together over time because they share a common trend. If on the other hand, the residuals are nonstationary, the residuals do not mean-revert to zero, the time series do not share a common trend, and the relationship between them is spurious because the time series are not cointegrated. However, we find that greenhouse gas forcings might have a temporary effect on global temperature. This result is illustrated in panel c of Fig. 3 in which the horizontal axis measures the change in the estimated anthropogenic trend. Panel c clearly shows that there is a positive relationship between temperature and the change in the anthropogenic anomaly once the warming effect of solar irradiance is taken into consideration. Other scientists will weigh in on these findings, as the debate over climate continues to rage. Still, it is increasingly clear that the most reliable and sophisticated scientific work tends to show that the anthropogenic global warming hypothesis is wrong. In that sense, it is fair to say that a consensus is emerging.